We Byzantine Catholics prepare for the great feast of the Dormition of the Holy Theotokos (Assumption of the BVM) on August 15 by a special fast. There is the venerable practice of preparing oneself for the Feast, hence some of us observe the Dormition Fast. This fast is one of the four fasting seasons of the Byzantine church year. The spiritual practices are those spoken of in the Sermon on the Mount: prayer, fasting, almsgiving, and forgiveness. Committed Christians do these things all year long; they are not limited to one or another time of the year. During fasting seasons we simply do them to a greater degree. 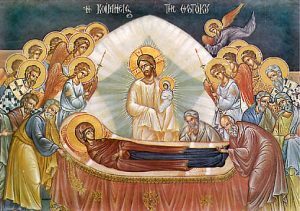 The Dormition Fast (Spasivka) begins on August I and lasts until the eve of the Dormition of the Blessed Virgin Mary (August 14), inclusively. Meat is to be understood as including not only the flesh but also those parts of warm-blooded animals that cannot be melted down, e.g., the liver, lungs, blood, graves, etc. Although it is not the authentic practice of the Tradition. the meat of fish and crustaceans may be eaten, as well of those mammals, that live constantly in water, as, e.g., whales. Dairy Products are to be understood as comprising products derived from mammals and birds, but not regarded as meat, e.g., cheese, lard, butter, milk, and its by-products, eggs, etc. Fats of plant origin, e.g., those derived from olives, coconuts, seeds of the sunflower and of the pumpkin, may be used. Voluntary penance, prayers for the intentions of the hierarchs of the Church, Bishop of Rome, the Major Archbishop, the Metropolitan, and the Eparchial Bishop; voluntary offerings to the Church, the seminaries, the Church in Ukraine, self-denial of alcohol, smoking, attendance at entertainment, etc., may be supplementary only with permission of a confessor. Bread and water alone is a good fast.